I think it’s been several years since I put in a plug for one of my favorite gardening magazines, Taunton’s Fine Gardening. 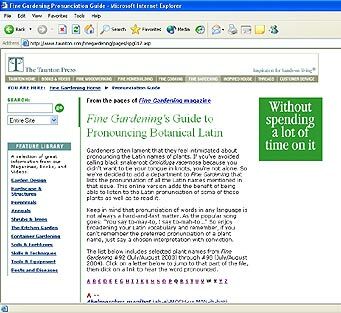 Truth be known, for you cheaters practicing the sublime hobby in Zones 5 through 10, you really need only subscribe to two gardening magazines: Fine Gardening and Garden Design. If you garden in the true gardening Zones 2 through 4, add a subscription to Northern Gardener (visit www.northerngardener.org) to the above two, and you’re completely covered. Anyway, Taunton’s Fine Gardening recently added a great new service to their website, a botanical Latin guide where you can learn how to pronounce the true names of all those wonderful shrubs and perennials you grow. Not only are the Latin plant names spelled out phonetically, you can click on the name to hear the pronunciation, uttered by a real human being, not some computer-voice deadpan.